The videos contained in this section depict the national reputation of Dr. Poston in robotic heart surgery. He is shown giving presentations at grand rounds for a variety of Medical Schools, an invited lecture at a prestigious national surgical society (AATS) and an interview that was telecast at the national sales meeting for Intuitive Surgical. Each of these talks illustrate the passion and deep understanding of the strengths and weaknesses of robotic heart surgery that has earned from being involved from the very beginning of the field. The video of the webcast from Univ of Maryland in 2006 shows one of the nation’s first simultaneous hybrid procedures ever performed. Further details about the hybrid procedure were discussed in the video of a PBS interview in Arizona. Dr. Poston provided this testimonial in 2010 about why he performs robotic and less invasive surgery. It was aired at a National Sales meeting for Intuitive Surgical in 2011, a time when robotic heart surgery was a central strategic focus for the company. This invited presentation was given in April 2015 at a national scientific meeting for the surgical society AATS, widely considered the most prestigious society for academic cardiac surgery. This presentation discussed the key characteristics of an effective robotic heart surgeon, focusing specifically on the value of high levels of expertise in order to perform robotic heart surgery safely. This interview was performed in 2013 and discussed the advantages and disadvantages of a new strategy for dealing with coronary artery disease called hybrid coronary revascularization. The “hybrid” approach combines less invasive heart bypass surgery with stenting of coronary arteries, thereby enabling a less invasive approach that still enjoys a long term success rate that is characteristic of conventional bypass surgery. Presentation given on 9/2010 as part of the interview process for the chief of CT surgery at UA. The rationale was provided for why robotics was a true paradigm shift in CT surgery using data and outcomes from Boston University (2008-10). The chair of the department was convinced and offered the chief position after this presentation. 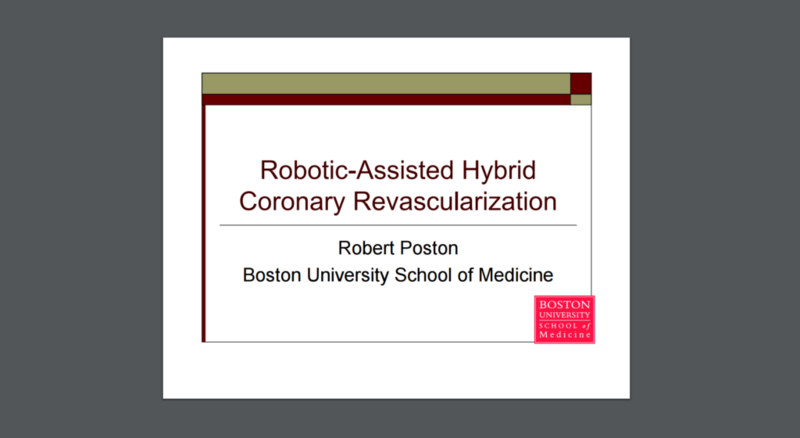 This 40 minute video shows a full length robotic bypass procedure that is followed by a heart catheterization to place a stent (hybrid procedure). It was filmed live as a Webcast in 2006, when Dr. Poston was at the Univ. of Maryland. This grand rounds presentation was given in May 2011 at the Department of Medicine at the Univ of Arizona. The presentation was given by Dr. Poston and Dr. Szerlip, the interventional cardiologist at UA that was the director of the hybrid revascularization program. Grand rounds presentation given at Univ of Arizona on 6/1/2011 after the 6 months that Dr. Poston had started his position. He discusses the results regarding the new robotic heart surgery program, highlighting a very fast start to the program. Within weeks of starting, it was clear that patients were coming to UA from all over the southwest because the robotic heart surgery option was not offered anywhere else in the region. Dr. Poston’s main research interest is the assessment of conduit quality and its association with the success of bypass grafts. In this seminar in 2013, Dr. Poston describes the use of a new imaging modality called OCT to assess bypass grafts in real time prior to using them in heart bypass surgery. The availability of this information in real time makes it possible to accept only the highest quality grafts, and perhaps improve long term results. Discussion about the pros and cons of robotic heart surgery with a group of patients that had the procedure in the past.